Reportedly bid $75 a share for Anadarko. Chevron's $65 per share bid accepted instead. OXY stock is down - maybe a buyback is better than a higher bid. Chevron (CVX) announced on Friday that it is buying Anadarko (APC) with a mix of cash and stock on Friday, for $65 per share. 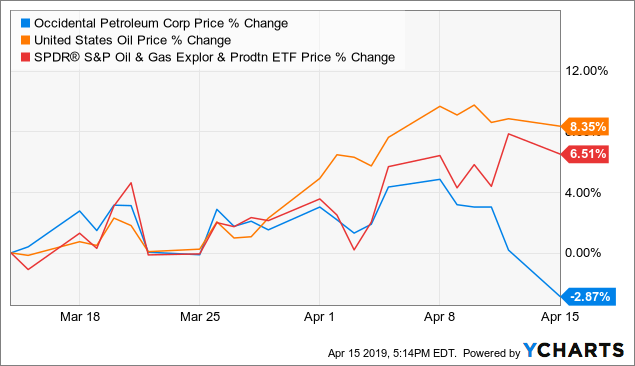 The same day, rumors surfaced that Occidental Petroleum (OXY) had offered as much as $75 per share for Anadarko, with a higher mix of cash. Reportedly, OXY is now considering bringing a higher bid directly to Anadarko shareholders. The Chevron/Anadarko deal is actually a little more complex than widely reported. On further analysis, it became apparent that Anadarko's ownership of Western Midstream (WES) was a key aspect of the deal. The actual net cost to Chevron for Anadarko was considerably lower than the $50 billion headline price, partly because of "consolidated" debt from WES and because of the value of WES shares held by Anadarko. Unfortunately for OXY, its stock has traded down over the past couple of days, as the market prices in the chance of a higher bid, which is getting some media attention. 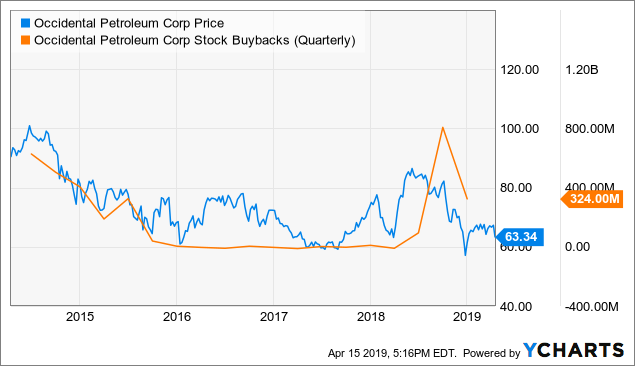 Despite the CVX/APC deal being less expensive and thus more accretive than reported, trying to top that bid and pay a reported $1 billion breakup fee could be far less accretive for OXY. The market is giving OXY an incredible opportunity... to buy back its shares at a discount. An unaffected share price could be 10%+ higher than the current price, considering where peers and the price of oil have traded over the past few days. With an extremely cheap cost of debt capital - a recent potential high yield offering was discussed at 4.3% for a 30-year billion dollar bond - and with a dividend yield of about 4.7%, OXY could opportunistically and accretively buy back shares, funded through cash flow or lower cost debt. This is not geared off of a specific valuation of OXY's business or of its future financial prospects. It is a one-time sale on OXY stock, available to OXY at a discount to its cost of debt. This is probably also reflective of a bond bubble, but that is to OXY's advantage. And interest rates are even lower today than when that offering was discussed a month ago. When the market gives you "free money" which in this case is a lower interest rate than the dividend yield, it's not a hard argument that you take it. Especially when the alternative is a bidding war with Chevron, a much larger competitor with much deeper pockets. One other consideration: With this opportunity for OXY, and with the daunting prospects of a bidding war with Chevron and having to fund a billion-dollar breakup fee, it is possible that Chevron may end up getting to buy Anadarko without having to raise its offer. This is great news for Chevron, and perhaps unfortunate for Anadarko shareholders, who reportedly could have gotten as much as "mid $70s" per share, with a large cash component.